Come and experience nature with a canoe or kayak trip down the beautiful Kickapoo River with Drifty's Canoe Rental. The Kickapoo River offers unmatched scenery of Wisconsin's driftless region. It is a very safe, slow moving river that can be enjoyed by a beginners as well as experienced canoe enthusiasts. The river follows a meandering, winding path through Wildcat Mountain State Park and the Kickapoo Valley Reserve, with plenty of places to stop for a picnic, swimming or exploring. Bring your own food or stop at the Paddle Inn for great food. Make sure to call ahead to get the latest rental pricing for canoes, kayaks and tube rentals. Reservations are recommended as we do tend to book out ahead of time for many days in the summer. There is no deposit required, just what day and time you would like us to save you the equipment. We take reservations by phone at 608-337-4288 or 608-487-3379. Drifty's Canoe Rental has combined with the Kickapoo Paddle Inn to offer two great businesses at one convenient location. We are located in Ontario, Wisconsin where Highways 33 and 131N meet. Call us today at (608) 337-4288 to reserve your trip today! 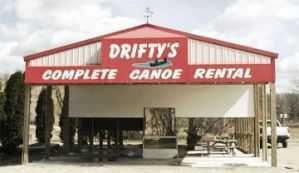 Page Summary: Drifty's Canoe Rental offers canoe rental, family vacation, kayak rentals and canoeing. Services such as kayaking, tubing and inner tube rentals also part of the scope of our business. We are located on the Kickapoo River in Ontario WI and are close to La Crosse, Onalaska and Sparta, Wisconsin. Other areas we serve include Tomah, Holmen, Hillsboro and Viroqua. We also service Westby, Prairie Du Chien and beyond.